To half of you this dessert will sound delightful and the other half, awful. If you're curious about this custard's flavor just imagine the offspring of vanilla pudding and yogurt. But the most important this is that it actually tastes good! So go ahead and make this Buttermilk Custard and surprise everyone to how good buttermilk can taste! Or don't, either way just buy some shirts. In a heavy medium-sized saucepan add the sugar, cornstarch, and salt. Turn the heat up to medium. Slowly whisk in the buttermilk. Be sure to have the egg yolks ready in a separate bowl. While constantly stirring add the cinnamon & nutmeg. Continue stirring until the mixture starts to thicken. Reduce the heat to low. Begin tempering the egg yolks by slowly stirring in a small amount of hot custard into the yolks. Once you've added about 1/2 cup of custard to the yolks, add the yolk mixture into the saucepan. Continue stirring to avoid burning. Add the vanilla. Stir for another minute. Remove from heat and pour into individual cups. Place in refrigerator for at least 2 hour to set. 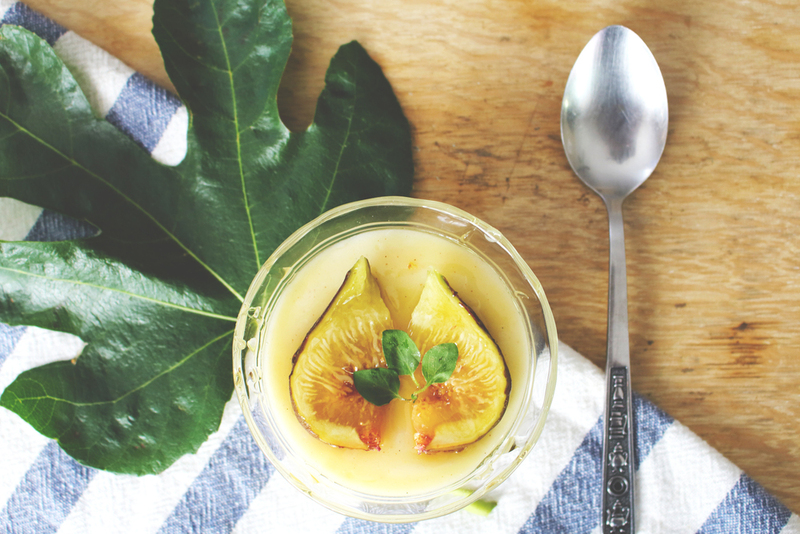 Top with fresh figs and honey! Enjoy!